Welcome back! The academic year begins with classes on Monday, and the faculty and staff of the Department of Political Science are looking forward to seeing you. For our entering students, their welcome included viewing the partial eclipse here in Cleveland in the circle in front of Kelvin Smith Library. Our CWRU colleagues from the Department of Astronomy provided telescopes, distributed eclipse glasses, and displayed pinhole box results, to the hundreds (if not thousands) of students, their parents, staff, faculty, and members from the broader University Circle and Cleveland community. Strangers shared eclipse glasses with each other (my thanks to Daniel, an entering student from New Jersey), and waited patiently and happily in long lines to view the partial eclipse through the telescopes provided by the CWRU Astronomy faculty, who provided a running (teaching) commentary on the event and answered questions. The Department of Political Science underscores President Snyder’s message. We welcome all CWRU students in our courses (none of which have prerequisites) and into our major (see Basic Information about the POSC Majoron the POSC webpage). Our small classes, taught mostly as seminars, provide the context for serious intellectual and disciplinary discussion about the issues: What constitutes justice? Why do nations cooperate or engage in conflict? How do people move from long-standing dictatorships to forge new democratic political systems? How are specific public policies developed and with what consequences? How can nations maintain international security and yet have relatively open borders? Who is a citizen and what constitutes citizenship? What constitutes social justice, and for whom? Our faculty approach these, and many other questions, from a strong political science disciplinary perspective, grounded in empirical evidence and logical argumentation, and we welcome all students to engage with us in our classes and in the many events our Department will offer across the course of this year. The first opportunity for such engagement has a social emphasis as well. The Department is holding a “Welcome Back” event on Tuesday, August 29, from 3:30 to 4:30pm, in Mather House 100. Our faculty are looking forward to seeing our students, to greeting new students, and to welcoming our new Visiting Assistant Professors, Girma Parris and YuJung Lee. We’ll provide some light refreshments. Please stop by; we look forward to seeing you. Fall Courses. We are offering a range of courses this fall, including three SAGES Departmental Seminars (POSC349, POSC370M, and POSC375; see the “Schedule of Classes” at http://cwru.edu/registrar/). Professor Julia Lee is offering two new courses: The Politics and Government of India and Women and Politics in Global Perspective. Both courses are open to all students and have no prerequisites. Professor Girma Parris is also offering new courses: Race, Immigration, and American Political Development and POSC321 News Media and Politics; again, these courses are open to all students and have no prerequisites. There are still openings in these courses for students. Please note that Professors Laura Tartakoff and Joseph White will be on sabbatical next semester, and hence will not be teaching in the spring. Students who hope to take a course with Professor Tartakoff or Professor White this year will have to do so this fall semester. Professor Tartakoff is offering two courses this fall: POSC326 Constitutions in Practical Politics and POSC328Topics in Civil Liberties; Professor White is offering POSC306 Interest Groups in the Policy Process and POSC383 Health Policy and Politics in the United States. American Political Science Association Annual Meeting. Finally, I want to alert our students to the schedule for the American Political Science Association annual meetings – the largest global convention of professional political scientists. These are being held in San Francisco, August 31-September 3, during our first week of classes. The meetings include short courses, workshops, panels, roundtables, and poster sessions, as well as receptions, book exhibits, and major public lectures. At least half of the POSC faculty will be attending the meetings. Professors Buchler, McMann, Parris, and Posner are listed in the official program. What this means for our POSC majors and minors, and students in our courses (or hoping to add a course), is that many of us will not be widely available during the first week of classes. Nonetheless, we’ll be available by email and will respond as soon as possible. And, of course, Ms. Jessica Jurcak, our Department Assistant, will be available to assist you. The Center for Policy Studies is searching for a sophomore or junior who can dedicate 2.5-3 hours per week to the Friday lunch program. Responsibilities include distribution of flyers each week, and helping with the set-up and tear-down of the lecture each week. Must be available from 11:45 am-2:00 pm every Friday for help with the lecture. Distribution of marketing materials can be completed earlier in the week. 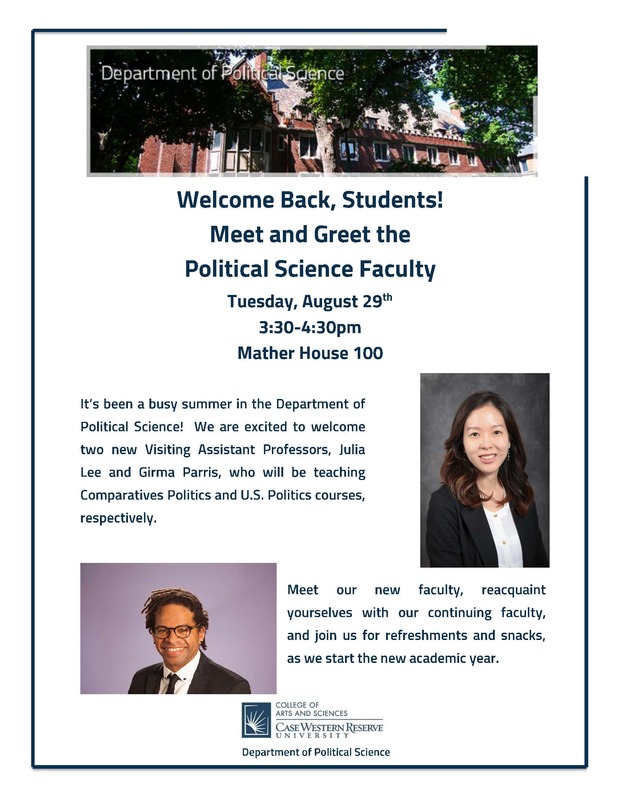 The Department of Political Science is hosting a Welcome Back event for all students! The faculty would like to have a chance to catch up with students as well as introduce two new faculty members that will be with us this year. Light refreshments and beverages will be provided. Mayor Frank G. Jackson is seeking a fourth four-year term as Mayor of Cleveland and he is facing eight challengers. In keeping with City Club tradition, all mayoral candidates whose candidacy has been verified by the Board of Elections were invited to participate in this primary debate. Tickets are $50 for nonmembers. This play is about politics and the ethical dilemmas it presents, written by Cleveland actor/director/ playwright Peter Lawson Jones, a former state legislator and Cuyahoga County Commissioner. Tickets are $25. Learn about the opportunities of working at McKinsey & Company: work in one of 22 sectors – from high tech to healthcare – and/or 12 business functions – from marketing & sales to analytics or sustainability – serving clients in all sectors. Congratulations to POSC alumna Krithika Rajkumar, (CWRU BA 2014), who is one of 29 finalists in the America’s Miss World pageant. Congratulations to Adjunct Professor Lev Gonick, who takes on a new position as Chief Information Officer and Professor of Practice at Arizona State University.